Kevin Stinson (Cheam Mountain Golf Course) holds the William Thompson Trophy after winning the TaylorMade & adidas Golf PGA of BC Championship presented by Axis Insurance Group on Tuesday at Talking Rock Golf Course. 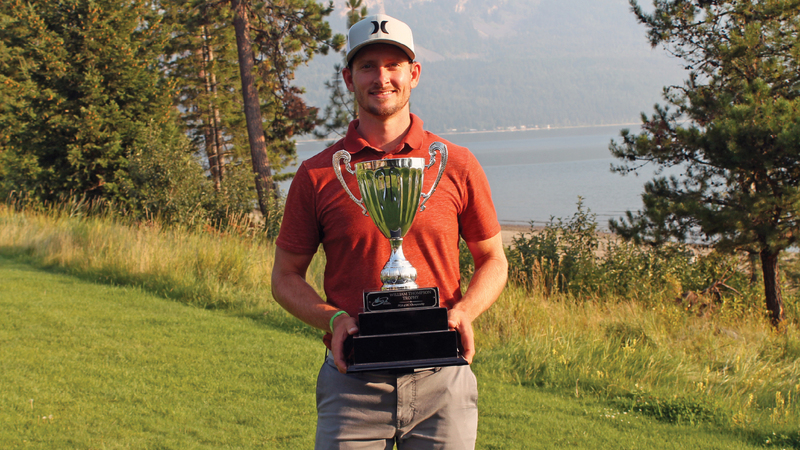 CHASE, BC (PGA of British Columbia) – With a course record-tying 6-under 66 Tuesday in the final round at Talking Rock Golf Course, Kevin Stinson powered his way to a victory in the 2018 TaylorMade & adidas Golf PGA of BC Championship presented by Axis Insurance Group. Stinson (Cheam Mountain Golf Course), who entered the day two strokes back of overnight leader Jonnie Motomochi (Morgan Creek Golf Course), made an early bogey but was flawless the rest of the way, making an eagle and five birdies to close out his first PGA of BC tournament win. Stinson’s name will be etched on the William Thompson Trophy as PGA of BC Champion, while he also earned $6,200 for the win and an automatic exemption into the 2019 TaylorMade & adidas Golf PGA Championship of Canada. Motomochi closed the 36-hole event with a 1-under 71 to finish alone in second place at 6-under. Mark Bicknell (Victoria Golf Club) also finished with a 71, including an 18th-hole birdie to finish in third place at 3-under. Oliver Tubb (University Golf Club) placed fourth at 2-under, while three-time PGA of BC Champion Bryn Parry (Point Grey Golf & Country Club) was fifth at even-par. While Talking Rock’s back nine proved difficult for many of the 79 competitors in this year’s field, Stinson played the home half in 6-under over the two days thanks in large part to some great work off the tee box. Motomochi, who only joined the PGA of BC in March and was playing his first tournament as part of the Association, still came away pleased with his result and impressed with Stinson's performance Tuesday. Motomochi, a former standout player and assistant coach for the Oregon State University Beavers, had played just one tournament over the past five years. Although earning $4,100 as runner-up might be enticing to keep at it, the 27-year-old isn’t expecting to make a full-fledged return to tournament golf anytime soon. Competitors this week raved about the golf course and the facilities at Talking Rock, which was hosting a PGA of BC individual stroke-play championship for the first time. Headquartered in Carlsbad, California, TaylorMade Golf is a leading manufacturer of high performance golf equipment with industry-leading innovative products like M3 / M4 metalwoods, M3 / M4 irons and TP5/TP5X golf balls. TaylorMade is the #1 Driver in Golf and also a major force on the PGA TOUR with one of the strongest athlete portfolios in golf, that includes world No.1 Dustin Johnson and five of the current Top 15 in the world. 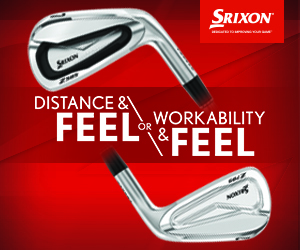 Learn more at www.taylormadegolf.ca. For over 80 years, adidas has been part of the world of sports on every level, delivering state of-the-art sports footwear, apparel and accessories. Today, adidas is a global leader in the sporting goods industry and offers a broad portfolio of products. Our strategy is simple: continuously strengthen our brands and products to improve our competitive position and financial performance. adidas golf partners with the top tour athletes who continue to win, including World No. 1 player Dustin Johnson, 2017 Masters Champion Sergio Garcia, two-time PGA Tour winner Jon Rahm, and Rookie Of The Year Xander Schauffele. The company's products resonate with consumers thanks to industry-leading performance from TOUR360 footwear, the Ultimate bottoms franchise, and our Women's range wear category. adidas Golf has a completely dedicated team that continues to service the Canadian marketplace with industry-leading products and service. Visit www.adidasgolf.ca for more info. The Axis Insurance Group was formed in 2017 through a brand amalgamation of several BC-based insurance brokerages with roots tracing to 1928. The experience of its combined 150 team members is uniquely positioned to serve Canada with risk-management and insurance services. Contact Axis to find out what coverage is available to be customized for your facility, whether its protecting your commercial property, insuring a tournament's hole-in-one contest and everything in between. By partnering with the largest insurance companies in Canada, Axis Insurance Group has access to the best coverage solutions on the market. Consider them for your personal needs as well, including for auto, travel, homeowner or tenant insurance and more. Visit axisgroup.insure to learn more.